The journal is an international edition which publishes the results of original scientific researches concerning tourism and trips and generalized examples from practical performance of organizations in this sphere. 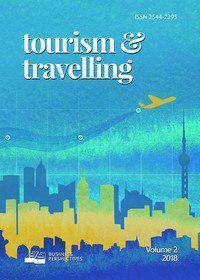 The main focus of the journal is on the following issues: types of tourist activity and trips, geography of tourism: international, national and regional tourism, independent and organized tourism, secondary wellness and business tourism, ecological and green tourism, medical and health tourism, sport tourism, etc. ; structure of tourism markets, dynamics of factors which characterize tourist activity; relationship of tourism with environmental protection, politics, economy, finance and other components of public activity; planning and management of trips, backpacking trips; tourism and problems of legal nature: problems with visa, problems of non-compliance with the terms of the contract by tourist organizations, violation of rights of citizens while receiving a tourist service; tourism and danger: terrorism, revolutions, natural disasters, etc. ; business and financial activity of tourist organizations, management and marketing of a tourist organizations, cooperation with insurance, medical, transport, hotel, excursion and other organizations; upcoming trends of development of tourist activity, space tourism.